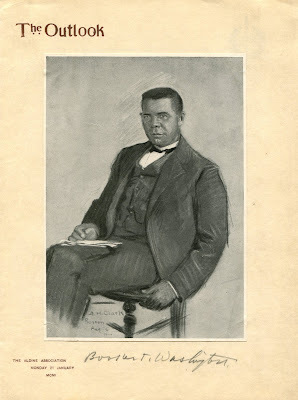 Booker T. Washington signed the cover of this menu from a dinner in his honor at a club in New York called the Aldine Association in January 1901.1 The autograph adds a personal dimension to this memento from what must have been an inspiring affair. It was hosted by The Outlook, a weekly magazine that had recently published autobiographical pieces by Washington. By the time of this occasion, the essays had been rewritten and were about to be published in book form under the title Up from Slavery. In the autobiography, the famed educator recounted his experiences as a slave child during the Civil War, the difficulties he overcame to get an education, and his work establishing vocational schools. Although the book sold well, events would soon show that its appearance did little to soften the lingering racial prejudices of many whites in the South. 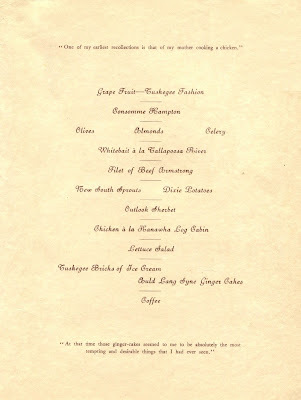 The dishes on the bill of fare also reflect elements of Washington’s life story. One of his earliest recollections was of his mother cooking a chicken. The chicken entrée below refers to the small log cabin in the Kanawha Valley of West Virginia where he and his family moved after emancipation. 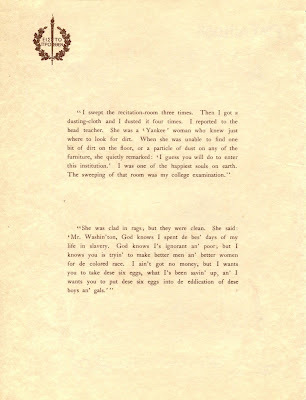 Some of the dishes are named after historically black colleges—the Hampton Institute where he attended and later taught, and the Tuskegee Institute (now Tuskegee University) which he established in Alabama in 1881.3 The conciliatory tone of the autobiography is seemingly expressed by the juxtaposition of the “Dixie” potatoes and the “New South” sprouts, using the term coined in the late nineteenth century by the editor of the Atlanta Constitution, Henry W. Grady, who called for a modernization of southern society and its attitudes. The meal ends with ginger cakes. The truncated quotation about them at the bottom brings to mind the musings of the French novelist Marcel Proust who remembered having madeleines with his aunt on Sunday mornings in the imagined village of Combray. In fact, Washington’s memories of the circumstances surrounding his pastries were far different. Recalling how, as a young slave, he watched two of his “young mistresses and some lady visitors” eating ginger cakes, he noted, “At that time those cakes seemed to me to be absolutely the most tempting and desirable things that I had ever seen; and I then and there resolved that, if I ever got free, the height of my ambition would be reached if I could get to the point where I could secure and eat ginger cakes in the way that I saw those ladies doing.” For him, they were symbolic of freedom itself. On October 16 of that year, Booker T. Washington dined with President Theodore Roosevelt and his family at the White House. Roosevelt, then only a month into his presidency, was anxious to consult with the black leader. However, when news of the meeting was released, it was viciously denounced by the southern press and politicians. Senator Benjamin Tillman of South Carolina infamously said that it “will necessitate our killing a thousand niggers in the South before they will learn their place again.”4 The Memphis Scimitar called it “the most damnable outrage which has ever been perpetrated by any citizen of the United States,” even though African Americans had been to the White House before—Presidents Lincoln, Grant, Hayes and Cleveland had received such luminaries as Frederick Douglass and Sojourner Truth. What provoked the vitriolic reaction to Washington’s visit was that he had been invited to stay for dinner, a gesture which implied social equality. The significance of what happened also ignited a spurt of optimism. 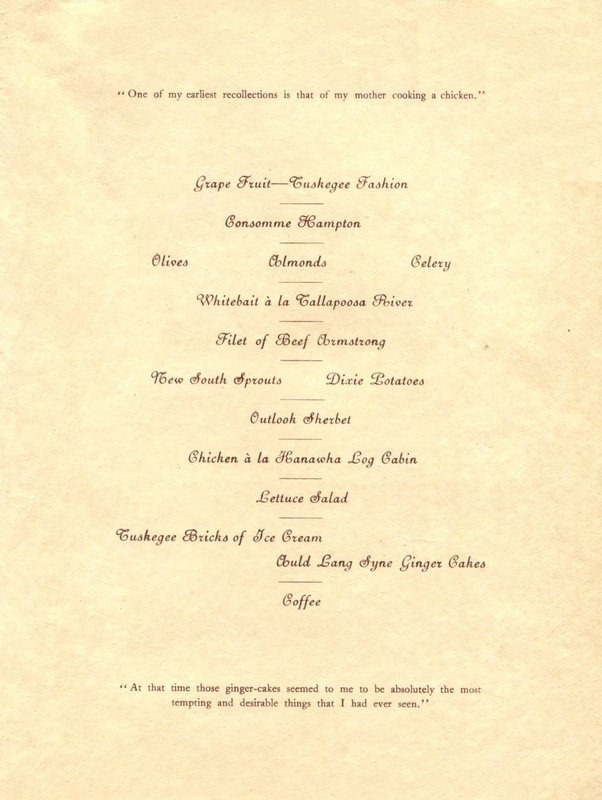 In February 1903, ragtime composer Scott Joplin applied for a copyright for an opera titled A Guest of Honor about Washington’s dinner with the Roosevelt family. Soon after Joplin took the work on tour that year, the proceeds from their performances were stolen. As a result, he could not meet the payroll and his company disbanded. The unpublished score, which had not been sent to the copyright office, has never surfaced and is considered lost. Almost thirty years would pass before an African American was again invited to dine at the White House. 1. The Aldine Club was established in 1889 in lower Manhattan at Lafayette Place as a gathering place for editors, artists, and publishers who worked in the neighborhood. It later moved uptown to 111 Fifth Avenue and was eventually renamed the Aldine Association. The literary club hosted a similar event for Mark Twain on December 4, 1900, seven weeks before this reception and dinner for Washington. 2. When in New York, Booker T. Washington stayed at the Manhattan Hotel on 42nd Street at Madison Avenue. Although the management invited him to stay there whenever he was in town, Washington volunteered to use the basement entrance so as to not offend some of their patrons. 4. Benjamin Tillman, a hot-tempered white supremacist who received a formal censure for assaulting another senator, was himself barred from entering the White House. 5. 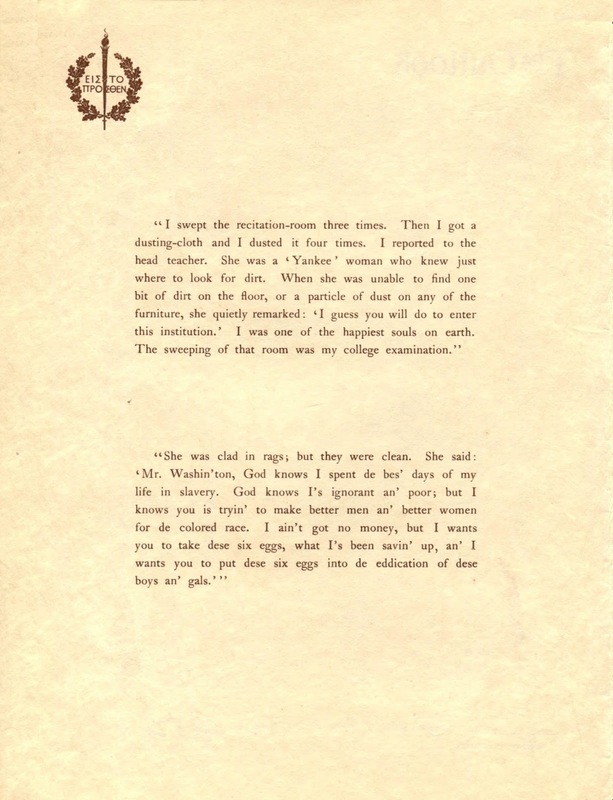 Theodore Roosevelt became an associate editor for The Outlook, publishing his first article on March 6, 1909.